What Happens To Your Season Tickets When The SuperBowl Comes To Philly? 1. 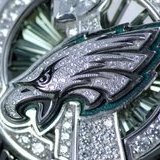 If the SuperBowl is in Philly and the Eagles are NOT in it, do you have the right to purchase SuperBowl tickets at face value? 2. If the SuperBowl is in Philly and the Eagles are in it, do you have the right to purchase SuperBowl tickets at face value? If you own a luxury suite, I think you do have the right to purchase SuperBowl tickets at face value and then resell them for $200,000-$700,000 or however much they go for. I wouldn't anticipate a Super Bowl being awarded to Philadelphia. It's possible, but I just wouldn't expect it. Will never happen with the Linc. We would have to have a brand spanking new stadium and more then likely it would have to be a dome. Doubt they pull another NY cold weather SB. So as a season ticket holder I dont think I will ever have to even worry about it. Oh that’s a shame. I would think they would at least consider it since we’ve never hosted one. Nah. NFL wants the Super Bowl in a warm weather city or in a dome. They do not want weather to be a factor. The New York Super Bowl was an exception, not the start of a trend IMO. if there is two things its that one game doesn’t really decide who’s the better team (like a series does). 3 periods at each teams teams home stadium.